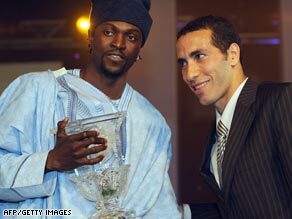 Emmanuel Adebayor was Tuesday crowned African football player of the year. The Arsenal striker saw off strong competition from Al Ahly’s Egyptian playmaker Mohamed Aboutrika and Chelsea’s Ghanaian midfielder Michael Essien to become the first ever player from Togo to pick up the award. “I’m very happy to have received this award,” he told the assembled dignitaries in Lagos, Nigeria, after receiving his accolade. “I’m highly honored by what I have done in African football and now that the World Cup is coming close and is in Africa, we’ll work hard to win the championship.” Adebayor, who beat Aboutrika into second place, was the overwhelming choice for the award after a stunning season where he scored 30 goals in all competitions for Arsenal and led Togo to the African Cup of Nations as well as the final round of qualifying for the 2010 World Cup. The Confederation of African Football (CAF) African Footballer of the Year award is one of the most prestigious awards in world football, one that recognizes some of the finest footballers in the game, whilst alerting the best teams in Europe to a huge pool of untapped talent. What do you think of Adebayor’s win Have your say Two of Africa’s most respected footballers, former winners Didier Drogba and Samuel Eto’o had backed the Arsenal man to win whilst former nominee Jay-Jay Okocha had spoken out in favor of the Aboutrika, who would have been the first African-based player to win the award in over two decades. “If it [CAF] is to pick the player that merits the 2008 award, I will give it to Aboutrika without blinking my eyes,” Okocha told Nigeria’s Daily Sun newspaper in the build up to Tuesday’s award. Certainly Aboutrika made a good claim for the accolade. Whilst Adebayor and Essien were pivotal players for club and country, both finished 2008 empty handed. Aboutrika, on the other hand, scored the goal that won Egypt the African Cup of Nations and drove his club side Al Ahly to both domestic league and African Champions League glory. The ceremony has been dogged with controversy in recent years. Nigerian forward Okocha, who controversially missed out to Samuel Eto’o for the 2004 award, claimed that internal political considerations, rather than footballing achievement, are the most important factors when deciding a winner. “Politics plays a very important role in the emergence of the best African player,” he said. “My inability to win the award [in 2004] made a lot of people cry foul.” And last year Chelsea forward Didier Drogba vowed to boycott the awards after being told that only players who turned up to the ceremony would have a chance of winning. “A prominent CAF official [was] telling me that if I did not come to the ceremony, the rules would be changed and the award would be given to the second-placed player,” he told French newspaper L’Equipe. The award eventually went to Sevilla’s prolific striker Frederic Kanoute. CAF deny that they switched the awards at the last moment. But it wasn’t all bad news for Egyptian football. “The Pharaohs” won National Team of the Year whilst Hassan Shehata was named Coach of Year. The other nominees Mohamed Aboutrika, Al Ahly, Egypt Few outside of Africa had heard of Mohamed Aboutrika until the rangy midfielder took the 2008 African Cup of Nations by the scruff of the neck. Aboutrika is quite simply the beating heart of both Al Ahly and the Egyptian national team. With his penetrating runs from midfield, goals and ability to be the creative fulcrum around which the rest of the team pivots, Aboutrika is arguably Africa’s most complete player. He may well be the only footballer on the list who doesn’t play in one of Europe’s top teams but there’s no questioning his achievements. In 2008 he lead Egypt to back to back African Cup of Nations victories, secured yet another domestic title for Al Ahly and, for good measure, was instrumental in their record sixth African Champions League title. Michael Essien, Chelsea, Ghana Last year was nothing if not action packed for Chelsea’s combative midfielder Michael Essien. Africa’s most expensive player began 2008 with a virtuoso performance at the 2008 African Cup Of Nations in his home country, driving the Black Stars to the semi finals and being named team of the tournament. But it was for Chelsea that he truly excelled, being instrumental in driving Chelsea on to second place in the Premiership and runners up in both the Champions League and the Carling Cup. Currently on the sidelines with a serious knee injury, Chelsea has been a shadow of their former selves without the Ghanaian. This is the fourth time in a row that Essien has made the final shortlist.